Buddhist pine is an evergreen shrub or tree that may grow 20 to 30 feet high. Branches are numerous, crowded and upright. Leaves are narrow-linear to lanceolate, stiff with an acute tip and obtuse base. Blade is dark green above and pale green below, with entire margins. Male and female cones are in separate plants. 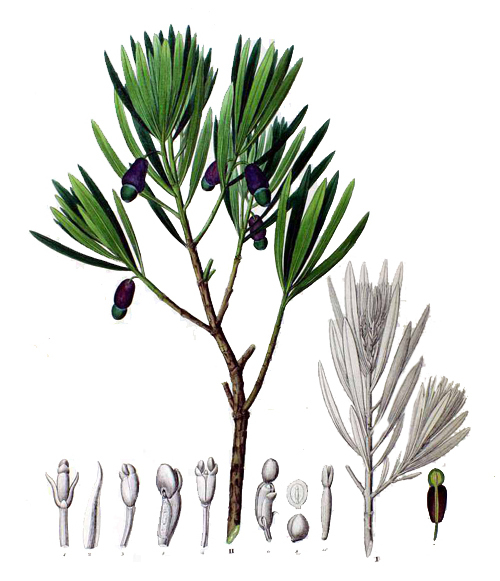 Seed is globose-ovoid and borne in a fleshy violet receptacle. - Introduced to the Philippines after WWII. • From the leaves, study yielded hinokiflavone, neocryptomerin, sciadopitysin, podocarpusflavone A and podocarpusflavone B. • Studies suggest anti-pigmentation, antimicrobial, cytotoxic, antiproliferative, cardioprotective properties. - Fruits reported to be edible, raw or cooked. - Stem bark used in the treatment of worms, especially ringworm and blood disorders. - Fruit decoction used as tonic for the heart, kidneys and stomach. - Wood: Used for making furniture, utensils, paper implements.